Your eyes may bleed, but you’ll be coming back for more. Perhaps. Have Inspired Cycle Engineering stepped out of the shadow of their handbuilt lineage at last? 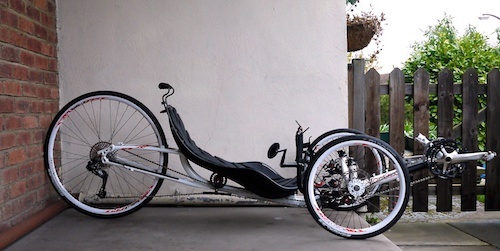 The 2012 ICE Vortex has almost nothing in common with the ICE Sprint and even less with the Adventure; it makes the Catrike 700 look crude and clunky, the Greenspeed X5 faintly pedestrian. It doesn’t get closer than this, at least not without losing blood. This beast appeared at Laid-Back-Bikes out of the blue, where the usual trikes, it’s fair to say, are rather more practical. 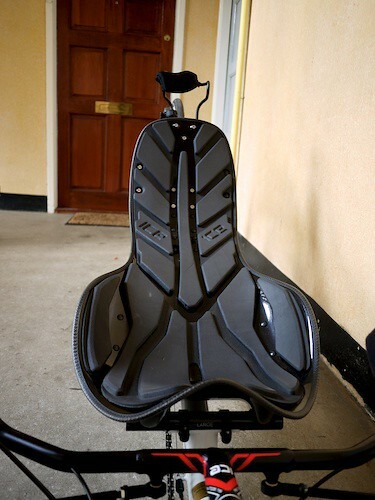 The seat height is staggeringly low at just over 6″ (16cm), combined with a seat angle of 25 degrees. In contrast, an ICE Sprint may only be 30% further off the ground, but this is amplified by the 37 degree seat recline – your head feels about 18 inches further up! Every aspect of this trike oozes class. The disc brakes are razor sharp, the shifting crisper than crisp and every part of the setup and finishing kit has clearly been meticulously evaluated. With 28mm Durano tyres and a very stiff hardshell seat, the ICE Vortex is set for a hard, fast ride, no quarter asked or given. 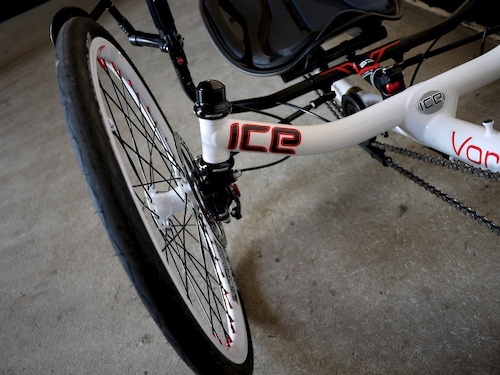 After one 60 mile ride I had a bruise over a prominent vertebrae and one on each shoulder blade – ICE ship this trike with a custom padding kit and you will be well advised to use it! (It’s worth noting that Schwalbe now produce the even-faster Ultremo ZX in 406. 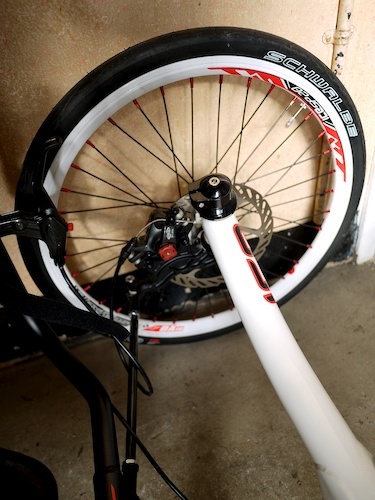 For those riding smooth surfaces this puts the Vortex at an even greater advantage over trikes like the Catrike 700 that are stuck with Kojaks. 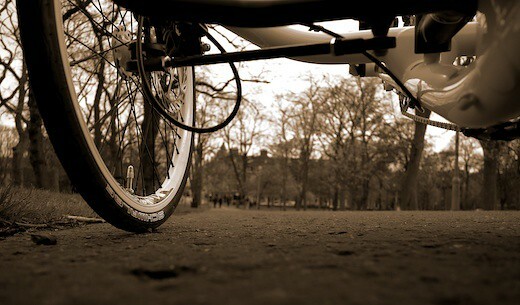 If you wouldn’t be willing to put up with the violence of 23mm tyres when the bottom of your trike is just 64mm in the air, of course, it’s a moot point). The minimal seat height, fixed stretched-out handlebar position and long narrow wheelbase gives the Vortex handling sharper than a surgeon’s scalpel – it’s hard to accept how rapidly it can manouvre, especially on good tarmac. 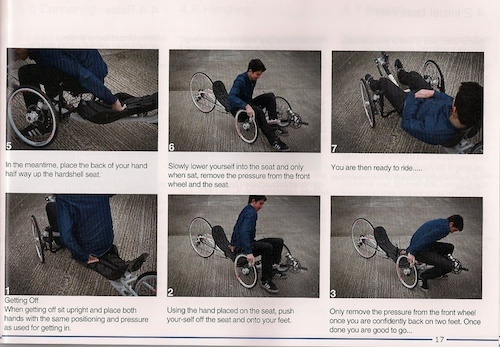 In fact, it might not even be possible to flip before the tyres wash out… although elsewhere on the internet I witnessed a bit of a rumpus over general trike helmet advice which suggests ICE themselves are not so sure! Initially I found the handling sharp to the point of nerve-wracking, and this is something novices should be aware of (a few miles and I was flicking it across the road without a care in the world). It couldn’t feel more different to the ICE Sprint I was able to swap for contrast. No head cam – I’m holding the camera straight up for a bird’s eye view! The Vortex is stiff – surprisingly so as I still half-expected it to be like the Sprint or QNT (which I once trialled on a 600km brevet) but with superficial changes. Not so… I really thought I observed a lot less flex in the Vortex and this doubtless contributed to the other surprise – it climbs like a mountain goat! The first section of any ride to the south for me involves a fairly short, stiff climb followed by a less steep but sustained gain over the next half dozen miles. The Vortex made surprisingly short work of it – certainly there will be faster climbing bikes, but it really was no slouch. On one test ride, I averaged just over 16mph from the house to the top of the moor (a gain of about 700 feet). Surprisingly, it was into the wind that I felt the Vortex suffered most – I guess there’s no getting away from the width of the extra wheel, however low you may be. In fact, on the 60-odd mile test route I put the Vortex through one morning before work, it was comfortably beating the Nazca Fuego until I turned into the wind, at which point the performance advantage vanished, and I comparatively crawled home from there! With ground clearance of just 69mm, there’s certainly more danger of grounding, although this should probably not be overstated – I was able to negotiate a variety of speed cushions at speeds I would never dare in the car! More significantly, I did manage to touch my heels a couple of times, although only while relaxed and wearing mountain SPD shoes – my road shoes (with the same cleat position) floated free in all positions. Someone with longer legs would have more air beneath their heels, someone with short legs less – fortunately shoe size tends to be correllated with height (I’m a size 9 / euro 44 at 5’10”). 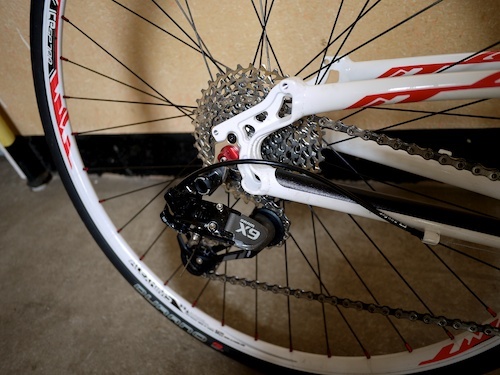 Unlike the Sprint and Adventure models, which feature ICE’s excellent quick-release flat fold, the Vortex is rigid and enormous. Not something you’d want in a city flat, unless you had it doing double duty as your sofa! Just about the only thing on this trike which adjusts (and unlike the Sprint and Adventure, it doesn’t adjust by quick release) is the seat – see above. I rode with maximum recline since I’m not sure who’d want to buy the ICE Vortex and ride around upright. It feels much more like a two wheeler than any other trike I’ve tried, the hardshell seat probably providing much of this sensation. As mentioned below, when you adjust the boom you need to re-cable the front mech, as only the inner extends forward of the cruciform…. You can also see the Vortex covered in Issue 43 of VeloVision magazine – see here. 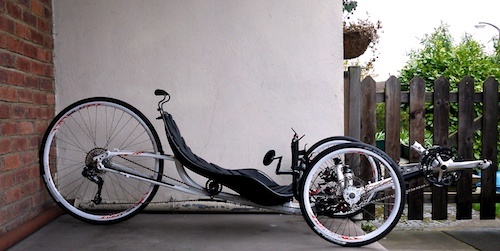 The wheelbase of the ICE Vortex is vastly longer than the Sprint to accommodate the larger wheel and reclined seat. 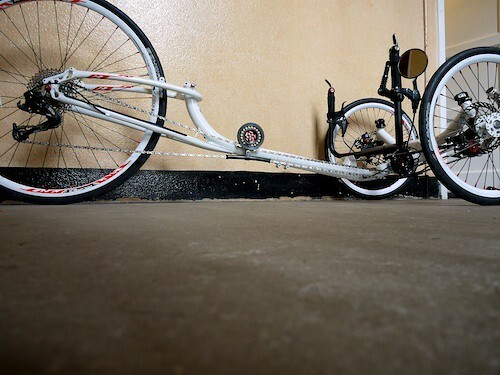 The Vortex bars are lower and closer to the wheels, but at the end of the day it all comes back to that seat, which is so much lower and more reclined that it makes these two very different vehicles. 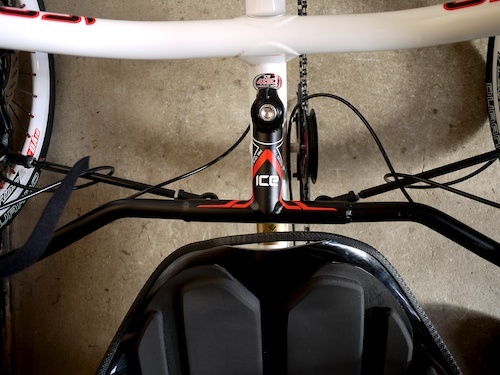 The bottom bracket on the Vortex ends up considerably higher relative to the seat, which gives a more closed, “two-wheeler” feel to it in my opinion. The Sprint features mudguards, making it pleasant to ride in all weather (you could fit guards to the Vortex, but again… why are you riding it?) and it’s generally far more practical, with the ability to take a heavy touring load, and travel in complete comfort thanks to the mesh seat and suspension. The Sprint’s all-round quick release adjustment makes for easy trimming on the road, and of course it folds flat in moments. The stock Vortex costs around 40% more than the Sprint, although options on either could easily distort this – the Sprint pictured above is actually a little more expensive (by my guess only) than a stock Vortex. The Raptobike (ignoring the tailbox on this particular model) is considerably faster, more agile, and feels more direct than the Vortex. 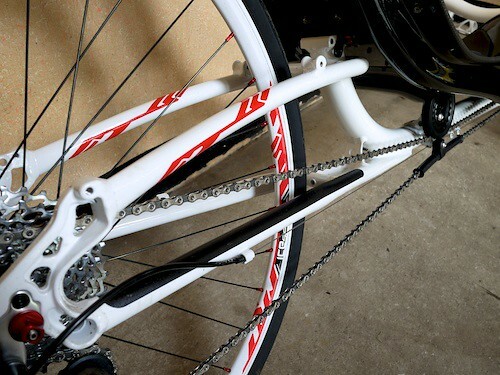 A stock Raptobike is lighter and also costs less than half as much. 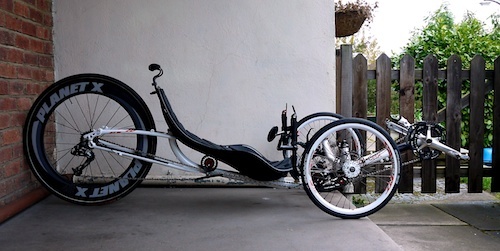 Of course, the Raptobike isn’t a trike and doesn’t have any of the trike wonder-factor that the Vortex (or indeed any trike) brings to the table. So you may argue, and I’d agree, that this isn’t comparing apples with apples. In terms of riding position, the Raptobike is more reclined and the BB is higher above the seat, contributing to the extra speed. (Of course, some people don’t like a high BB, but that doesn’t mean it doesn’t work). It goes without saying that the ICE Vortex doesn’t have a suspension option. Not only does this save weight, it gives a pleasing (if not alarming!) directness to the drive and handling. However, there are some downsides of course; if you don’t set the seat up as comfortably as possible, it will punish you. Also, everything you put on the Vortex will be vibrated to pieces, from the front light (had to stop and tighten up part of the mount) to the rear light (came off within five minutes), to the mirror (half worked its way out of the fitting before I caught it). Against expectations the foam didn’t seem to leave me over-sweaty, compared with a Ventisit; it will undoubtedly be lighter than that industry standard yet heavy pad (although I didn’t attempt to peel it off and check!) and makes me wonder… something to confirm on a hot summer’s day? It is allegedly possible to get a rack fitted to the Vortex and carry a variety of luggage – but I have to wonder who would ever want to do this. Fundamentally, this is not a trike that you should own if you plan to load up anything more substantial than fluids, waterproof shell, and minimal toolkit – in my opinion anyway. Remember, everything on the Vortex will get shaken apart on rough roads unless you fit tyres that deaden the ride. You could put luggage on a top of the range diamond-frame racer, but if you did, why exactly are you riding that bike again? There’s the question of the weight limit too, which is (for me) generous at just over 100kg, but many will easily exceed that with even a day touring load. This is not a tourer. 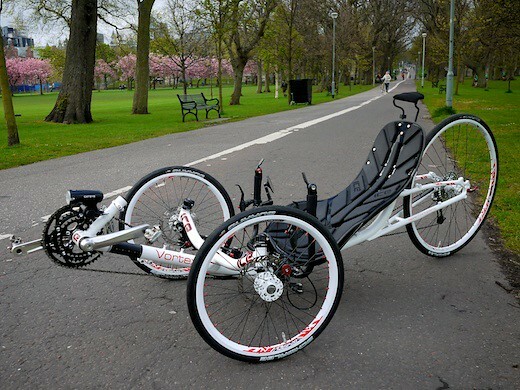 ICE do make the Sprint 26 which I’ve ridden briefly and that would be a far happier choice for someone looking for a versatile trike with the advantages of the larger rear wheel. Having said all that – you will need something to put your toolkit and spares in, because the hardshell bucket seat makes it impossible to use the outside pockets of a standard cycling jersey, which is my usual tactic. 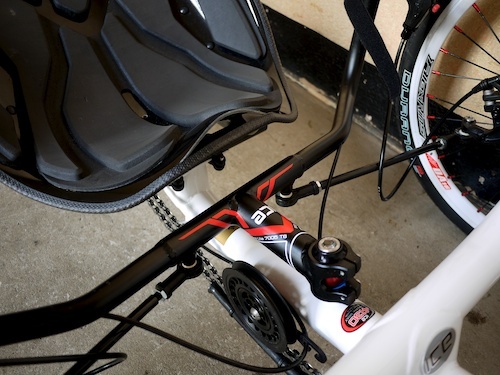 The close proximity of the seat back to the rear tyre precludes a seat back bag, leaving you perhaps with the smallest of the Radical Banana bags, or some solution involving the two seat-back bottle mounts (many riders use bottle-based toolkits). At the end of the day, you *could* carry things on a Vortex, but please don’t. Seriously. I don’t like to dwell on weight for two reasons – it’s a measurement that has far too great an emphasis placed upon it by everyone who isn’t seriously into (unladen) hill racing and most of the riders who think they are, are just too heavy to appreciate a really lightweight bike/trike anyway. This won’t be a problem for the average owner, but even the useability of the Vortex takes a back seat to weight at times – you can’t adjust the boom without undoing the front mech, because it’s only bare inner cable forwards of the cruciform! 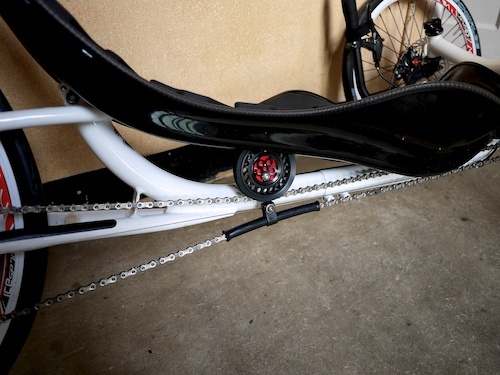 This ICE Vortex came equipped with a standard triple chainset up front. As with many recumbents the triple rings are put to good effect giving a wide gear range for a very modest increase in weight. In this case, an exceptionally low climbing gear (something around 22.5″, so low I wasn’t able to find a hill steep enough to use it) and a respectable high (122″ – similar to a conventional racer). As a bonus, the 700C wheel uses a standard cassette, rather than the tiny-toothed, fast-wearing and expensive Capreo, although to be fair, it would take many years of riding before the cost of Capreo cassettes evened up the playing field! 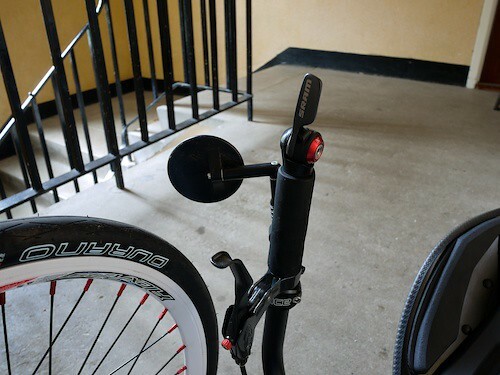 The flipside is that removing the wheel felt like it required an extra hand – but I’m sure you’d manage! There are two power idlers on the Vortex, both look like a proprietary ICE design and are very large diameter. The angles of deflection are actually rather modest (unlike on a two-wheeler where the idler must get the chain up to a BB which is higher than the front wheel). Compared with the somewhat-flexy feel of other ICE trikes I’ve ridden, the Vortex felt much stiffer around the bottom bracket. I could still bend it a little when stationary, but I didn’t notice any issues actually riding (I’m a bit of a spinner, of course). 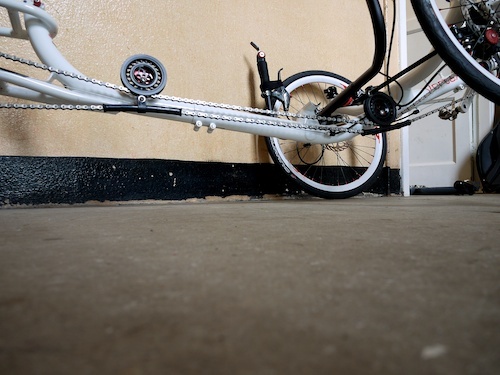 ICE are rightly acclaimed for the excellent indirect steering that features on all their trikes- rather than just welding a handle onto each wheel, a system of tie rods is used to link centrally-mounted bars to the two front axles (hence “indirect”). Every ICE trike I’ve ridden handles like a dream, but as I mentioned up top, the combination of seat height, recline, stance and tyre selection made the Vortex extremely responsive – almost uncomfortably so. Once I relaxed into it I found the steering pleasantly precise rather than twitchy. 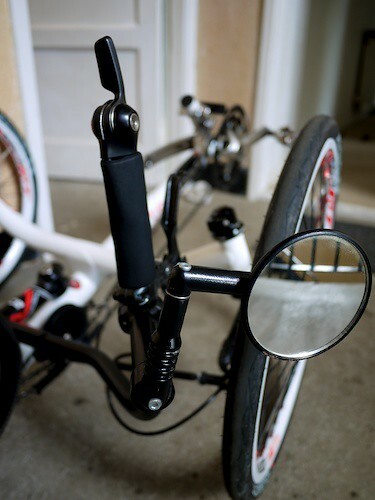 It is worth noting that to save weight, the Vortex uses a fully rigid bar – you can’t adjust the width or angle as you can using the (quick release) multi-part bars on other ICE trikes. 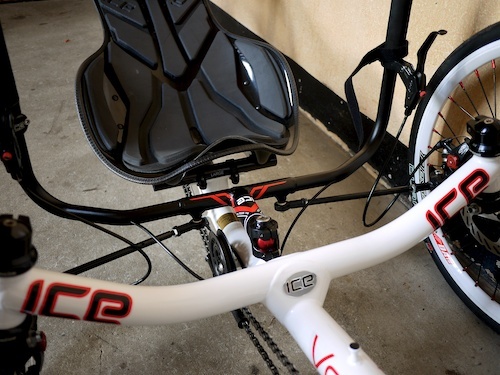 I have relatively long arms for my height (5’10”) but I was already feeling a little stretched once the seat was laid back – perhaps ICE can provide the one-piece bars in different configurations, but either way another reason for a prudent test drive. As tens of millions of Europeans demonstrate on a daily basis, it’s perfectly possible to live a distressingly long and healthy life as a regular cyclist while never having seen a bike helmet. You’re also pretty unlikely to die if you eschew the flapping flag – plenty of people drive around carelessly but not many drive on that strange boundary where they’d miss something as large as a trike but see a tiny flag (IMO anyway!). A mirror, on the other hand, is quite essential. The ICE Vortex came with a small mirror that I didn’t even get as far as trying outside the ship – instead we fitted (and I highly recommend) this excellent Mirrycle. The transmission from road to bars was so acute that even this mirror was barely good enough when the surface got bad – such a contrast with the crystal-clear view from something like the Fuego or Furai! 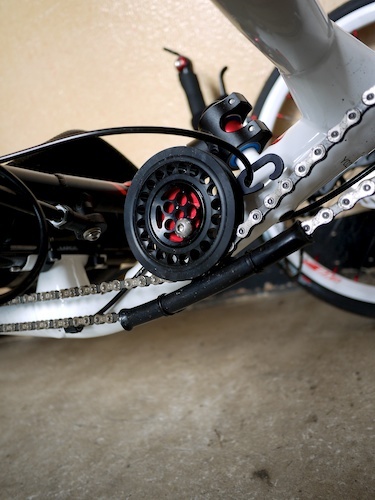 Stopping power on the Vortex is provided by a pair of Avid BB7s – standard cable road brakes. Response to my inputs was crisp and precise and the levers have reach adjust and other goodies. 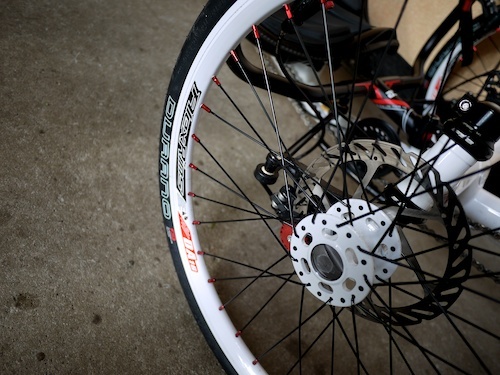 On 20″ wheels, the 6″ rotors have the same mechanical advantage as 8″ downhill rotors on a 26″ wheel, so there’s absolutely no shortage of power. 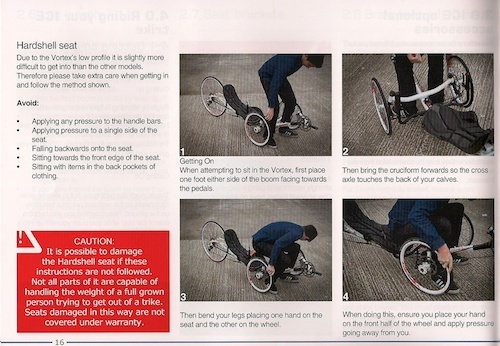 I wouldn’t be surprised if you could get the back wheel into the air with fingertip braking… but I didn’t want to try! 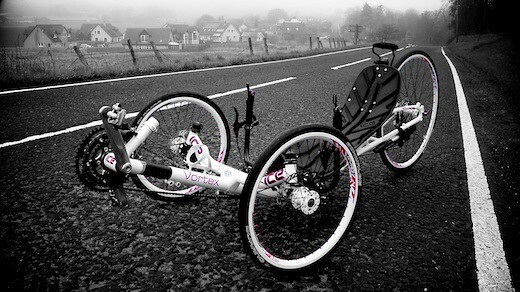 As well as epic style, these hubs feel very free rolling – particularly the big rear which keeps going forever! One slight confusion is that the Vortex rear end is spaced to 135mm (mountain bike standard) not 130mm, so you can’t make use of the world’s enormous range of fast wheels without serious work to swap axles (or just prying apart the frame, which would probably work, if you own it!). To be honest I think it looks better with the stock wheel too! Impractical. Uncomfortable. Expensive. Not as fast as a cheap two-wheeler. You could level all of these accusations against the ICE Vortex and, if I’m honest, all of them might stick. On the other hand, here is a trike without compromise – stiff, very fast compared with other trikes, very light, very aerodynamic. The kind of trike that, however impractical, sits there and begs to be taken just a few extra miles. 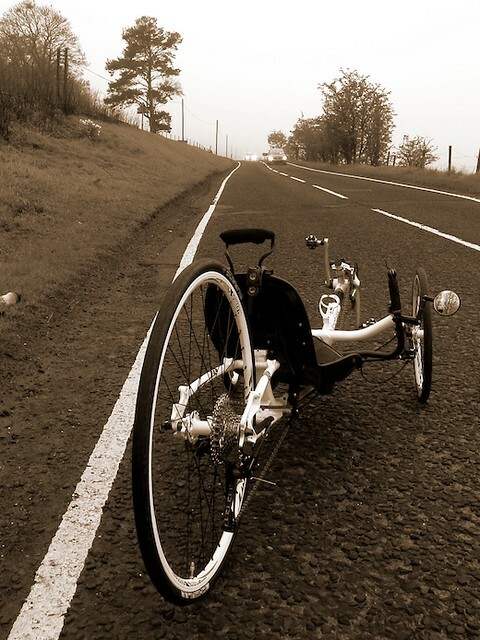 If you’re going to ride a trike and are interested in trying to keep up with roadies, this is the one you need, period (but still, good luck!). If I could have just one trike, it wouldn’t be the Vortex… but I think I would always regret it! Hi Dave thanks for that interesting test/review, on another matter i was wondering if you care to write something about carbon rims, for example how do they compare to a lightweight regular racing rim, if one is looking for speed advantage, do they really make a difference? 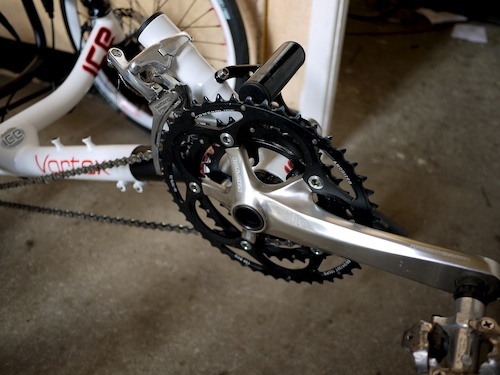 I’m hoping to pick up a power crank over the summer, in which case I’ll definitely run a comparison and write up! How much slower is this trike compared to a two wheeler? It’s hard to quantify as I didn’t have my powertap when this trike came in. If I had to ballpark it, I’d say 2mph slower than the Fuego on a mixed route, if you ride in the mid-high teens. That’s pitting an out-and-out speed trike against a multi-purpose two-wheeler as well. Hola Santi. Trikes ICE son de muy buena calidad! El Vortex es casi como una bicicleta de carretera. Para vender en su tienda, usted tendrá que llamar a la fábrica en +44 1326 378848 o envíe un correo electrónico a “sales@icetrikes.co”. Espero que esto ayude. Jeff, on a good surface I don’t think there is that much of a difference in speed between the Vortex and a two-wheeler, but for ‘good surface’ you really need to read ‘race track’ or a road without any potholes (or ninja avoidance skillz). I don’t think gradients are that big a factor. A lot of my best commute times were achieved with a Windcheetah, and the Vortex is perhaps a little bit smoother over chipseal. 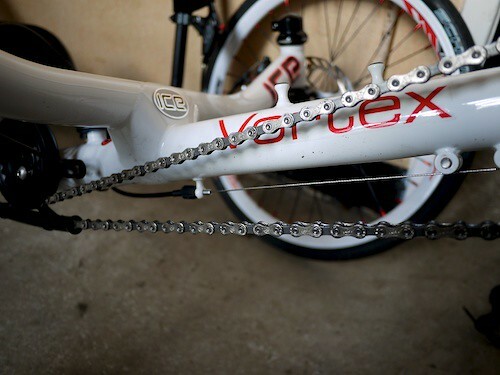 Dave, you need to get LBB to get another Vortex in for testing with the powertap, or speak nicely to Neil and Chris!